One of the things I didn't anticipate about motherhood is the kids' constant planning of birthday parties. We have literally hosted one legit birthday party, ever; and yet our lives seem to be a constant verbal stream of "this will be my birthday theme" and "this will be my birthday cake flavor/decoration" and "this is who I want to invite to my birthday party." Interestingly, their ideas for birthday party themes and decorations only extend as far as their experience of the same. 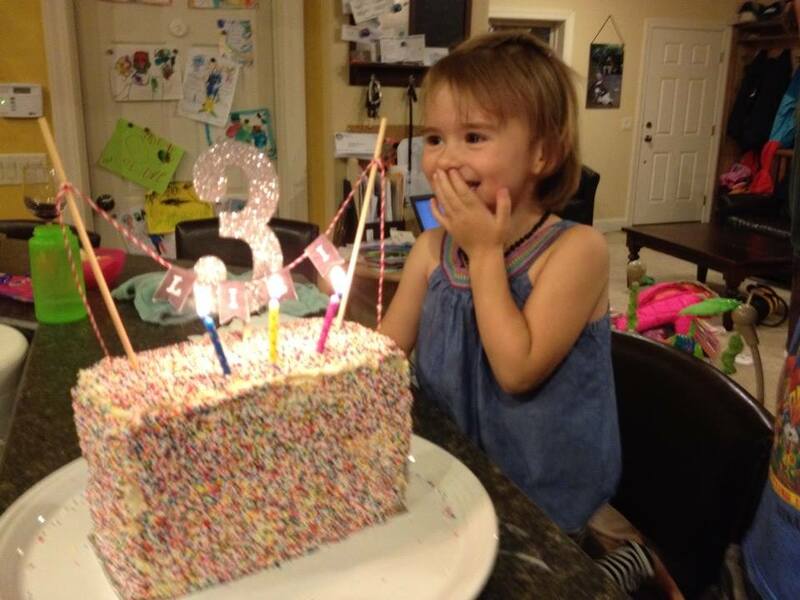 When Lili turned three, I went all out and did the Pinterest coated-in-sprinkles cake, and it blew her mind. She talked about it all year and wanted the same cake for her fourth birthday, along with the same Dollar Store butterfly decorations. She literally could not imagine anything better. "Now to him who is able to do far more abundantly than all that we ask or think, according to the power at work within us, to him be glory in the church and in Christ Jesus throughout all generations, forever and ever. Amen." (Ephesians 3:20-21). It's hard to imagine, but faith assures us that this is true.